When I was a young boy my mother brought me to Lyndhurst and showed me the house where she had lived as a young girl. All I could remember was that it was white, imposing and set in its own grounds. Fifty years later I moved to Brockenhurst and became interested in seeing if I could find the house. My grandfather worked in coal logisitics, organising its delivery to strategic locations, mainly sea ports for the Royal Navy and merchant shipping. 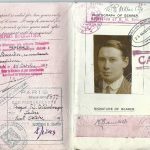 I knew that he never stayed long in any one place because his work took him all over Europe, and I knew also that he had never in fact owned a property. I have been a volunteer in the Christopher Tower Reference Library in the New Forest Heritage Centre in Lyndhurst for six years now, and in quiet moments tried in vain to find any documentation which might point to where the family had lived. One of my recent jobs in the library has been preparing the digitised copies of the Forestry Commission records of leases (Lease Books) into bundles for entry into our Adlib database and for publication on the New Forest Knowledge website. I had just finished a bundle when I looked at the last page of a lease and there was my grandfather’s name and a signature. Was it my grandfather? What was the probability that there were two people called Herbert Bamber leasing property in Lyndhurst at the same time? There are strong similarities between the passport signature and that of the lease, but the capital Bs look quite different. Equally there is a long gap in time between the signatures. 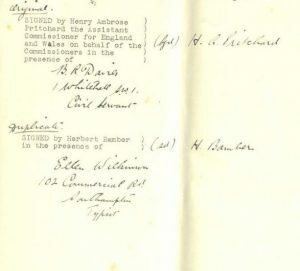 Page two of the lease gives Herbert’s address as No 1 Canute Road Southampton. Our library copy of Kelly’s Directory for Hampshire 1931 shows that 1 Canute Road was occupied by Clarke, Stephenson & Associated Co. Ltd, coal factors. Now what is the probability that there were two people called Herbert Bamber, leasing property in Lyndhurst at the same time and both working in the coal industry? It begins to seem more like a certainty. We shall know for sure only in 2031 when we get access to the 1931 census. So where is this property? It turns out to be Crown Lodge, now occupied by the New Forest Nondescripts Club, on Church Lane in Lyndhurst. It was originally called The Bird’s Nest for reasons which the photo make clear. 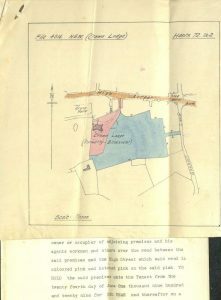 The lease also shows that the land attached to the house comprises not just the basic property coloured red, but most of what is now the main Lyndhurst carpark coloured blue. Ironically, and somewhat irritatingly, three times while volunteering in the Library I have been fined for breaching parking regulations on land that was leased to my grandfather. We have recently uploaded an album of photographs, most of which feature boats. Can you help us with any further information about the boats, places or people featured in the images? If so, please post a comment. 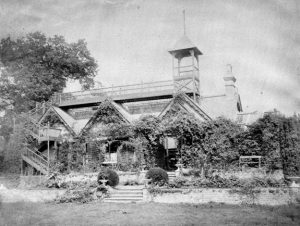 Can you help reveal the buried secrets of Burley? Dig Burley is a community archaeology festival taking place in and around Burley during Easter 2019. It is a joint project between the Burley Local History Society, Burley Parish Council and the New Forest National Park. Dig Burley will take place from Thursday 11th through to Sunday 14th April 2019 and feature talks, workshops and exhibitions. We are also seeking local residents and families who would be happy to open a small archaeological test pit on their property? So if you live in Burley why not register now to join the fun? If you’re not a Burley resident don’t panic as there will be plenty of opportunities to visit and get involved in the project, also we will be looking for willing communities for future years! Dig Burley HQ will be right in the heart of Burley at the Wathen-Bartlett. Visitors and participants can pop in at any time during the event to find out what’s going on or take part in workshops, help with finds processing or just grab a hot drink and a chat. At the beginning of each day of Dig Burley at 09:30 there will be an informal morning briefing where participants and locals will receive updates on Dig Burley progress and this is when you can register and collect your Dig Burley Packs. Even if you haven’t pre-registered you can join the fun at any time between Thursday 11th and Saturday 13th. Burley Manor will be hosting an free evening event for us on Friday 12th April with a special guest speaker; Tim Taylor the creator and Series Producer of Time Team. The event is open to all participants, residents, volunteers and visitors. It will be an opportunity to celebrate archaeology and Burley and a chance to catch up with the community. Though this is a free event tickets need to be booked so please visit: www.burleymanor.com/whats-on/dig-burley/ to book your place. At least three workshops will be hosted at the HQ on Saturday 13th. These workshops will give you the opportunity to learn more about archaeological finds, get hands on and maybe help you identify what you have found in your test pit. Workshops are open to all participants, residents and visitors. Workshop 2: Get to know your Pottery with Andy Russel from Southampton Archaeology. (14:00 – 15:00). This will be a 30 min led session with a 30 min open session at the end to discuss finds from Dig Burley or other pottery finds you may have found before the event. Workshop 3: Get to know your Bones with Anastasia Vasileiadou from Southampton Archaeology. (15:00 – 16:00). This will be a 30 min led session with a 30 min open session at the end to discuss finds from Dig Burley or other finds you may have found before the event. Once the digging is done and the finds are washed and processed we will be writing up reports and accounts. Once we have completed these we will invite everyone back together to see all the results and what they might have revealed. We hope it does, however, if you are still slightly unsure then read on to find out exactly what’s involved and the support available and then don’t forget to register and join us. What is a Test Pit? A Test Pit is a small archaeological excavation, consisting of a square trench measuring 1m by 1m and up to 1m deep that can be dug by hand, by anyone, in an open space in their garden. The Test Pit is dug methodically, i.e. layer by layer, and carefully recorded, with the aim of identifying evidence of past human activity, usually by finding pieces of pottery and other material, or, if you’re lucky, archaeological features such as rubbish pits, building postholes or even wall foundations. While we can learn a great deal about the history of our towns and villages through study of historical documents and maps, place names, aerial photographs and so on, archaeological excavation is often the best or only way to add to or confirm the results of such research. The opportunity for large-scale excavation however, particularly within our established settlements, is usually rare and so the excavation of a collection of Test Pits, which can be squeezed in anywhere throughout a village is a good alternative. Test Pits are also a great way of allowing a community, with the help of professional archaeologists, to investigate its past history and learn a bit about how archaeological excavation works. By collating the results from all the Test Pits the archaeologists will try to establish a general picture of the origins and development of a settlement, and hopefully find out something about the people who lived there. A guide booklet and the ‘Dig It’ pack will be distributed to all registered participants and volunteers which will explain how to dig and record an archaeological test pit somewhere in your garden. It will include test pit templates, step by side guide, recording booklets, photo scales and a list of equipment you’ll need. The “Dig It HQ” (Wathen-Bartlett @ The Burley Club) will be open at all times during the event with support on tap, local displays, maps, communal finds processing space, finds ID tables and importantly a hot cup of tea and a biscuit. Everyone will be encouraged to report back their progress and findings throughout the project so that the project team can let everybody know what else is going on and allow you to watch the story of your village unfold. Following recent work to digitise a family photo album shown to us by Dionis Macnair a couple of photos with their captions jumped out. They were photos of the Ladies Rifle Club shooting at Shappen Bottom in 1913. They show 3 ladies firing off along the rifle range one of whom was Dionis’ mum Eleanor Ruth Dent. The two other ladies are Cathy Thompson and Mary Violet Dent; Eleanor’s mother. The rifle range does not feature on the 1943 training map of the New Forest and is not mentioned in reference to the three Rifle Volunteer Corps ranges that can be found in the New Forest at Brockenhurst, Burley and Lyndhurst. A quick bit of research with historic maps available from the National Library of Scotland shows the range in use, but recorded as ‘Old Rifle Range’ on the 1870 Ordnance Survey Map, it is marked as disused by the 1896 edition and doesn’t feature on the 1907 edition at all even though these photos from 1913 show it still in use. Looking at the Lidar it is possible to see some disturbed ground near the firing off point, but not much else. The fact that this small range fired across tracks and its location, and lack of link to the Rifle Volunteer Corps or later military training suggests that this was more of a local community range potentially used for training for deer shooting or similar. We currently believe these are the oldest known photos of one of the New Forest rifle ranges in use. However, please let us know of any older photos from any of the other ranges.